One of my fondest collection of memories of the presence of art in my life was when I was in preschool. By this age, I was already drawing with crayons on endless reams of paper, playing with stuffed animals and dolls as if they were real, and listening to all kinds of music, from opera to glam rock. A huge influence for me artistically as I was growing up was my father. He would show me classic movies, check out huge picture books with amazing illustrations, and have me watch and listen to ballets and operas. This introduction to opera and ballet by my father is where my favorite memories stem from. I learned, through my dad, about all the different stories that were told in operas. 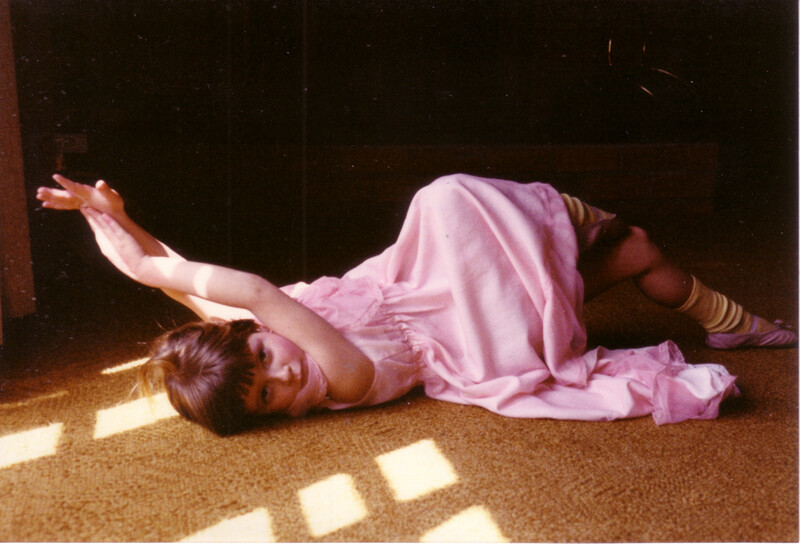 When we had long afternoons together at home after preschool, my father and I would plop down on the floor by the stereo and he would explain to me the story as it played out over our living room speakers. Through these afternoon activities, I learned about the love story between Prince Ziegfried and Odette in “Swan Lake”; I remember being in calmed by the soft sounds of Mozart’s “The Magic Flute;” and bouncing around the room when hearing the fervent strings of Stravinsky’s “The Firebird.” I would get so excited about these stories that I would carry them around with me, telling my friends at school about them and subsequently sitting them down in front of the TV whenever I could to have them watch these great tales. These stories became so ingrained into me that my father and I would take on roles of the characters in these pieces and start acting out the scenes from the operas right in the middle of the living room. He would play Grandpapa Drosselmeier and I would play Marie from “The Nutcracker,” or he would play Figaro and I would be Rosina in “The Barber of Seville.” I’m sure at this point that this may have been the start of my fondness for live performance. Twenty-three years later and I am a professional actor in the DC area. I think back to these afternoons with my dad as having a huge impact on how I live my life in terms of how I think and feel, and also how I view the world. His introducing me to classical music really gave me the confidence at other stages of my life to tell my own stories. The exposure to art alone, and the motivation of wanting to teach a child about art and encourage them to explore it for themselves emboldens them to create their own art. Click on the video below to watch Vanessa explain why she believes arts education matters for DC students. When I was seven years old, I auditioned for my first musical at a local children’s theatre program. I was shocked to find that not only did I get into the musical, I got a solo too! The show was called “The People Garden” and it was about a classroom full of elementary school-aged students. I was playing the part of the little girl who always got left out at recess. I will never forget the first rehearsal. It was just my director, Jill, and me. We were working on my song. Jill kept telling me to sing it over and over again, and every time I just got more and more frustrated. I wasn’t singing the notes right and I kept forgetting the words and I knew the tempo was all wrong. Jill kept insisting that the music didn’t matter; she just wanted me to act. I remember thinking, “What are you talking about? I’m singing. Isn’t that enough?” Suddenly I realized what made those fancy Broadway actors so special. They act and sing at the same time! At that moment, I promised myself I would forget about the music and just focus on the acting. I remember looking at the clock and seeing that Jill and I only had five minutes left in our rehearsal together. I had one last chance to act and sing at the same time. I took a deep breath, looked at Jill, and sat down where I was supposed to start the song. Jill smiled and winked at me, encouraging me that I could do this. I felt like the world was hanging on my shoulders. Once the music started, I looked out towards the house and opened my mouth to sing. I thought about the character and how she honestly felt like nobody at school cared about her. I thought about the other kids and how cruel they were to her for no particular reason. I remember messing up a few words and notes, but I didn’t care. I was someone else at that moment. I was my character. When the song ended, I took a deep breath and then looked up at Jill. Before I knew it, she was picking me up and spinning me around, screaming, “You did it! That was it!” I felt like I conquered the world. This breakthrough moment I had with my director was not life-changing because it made me a better actor—after all, I was only seven. It was life-changing because it taught me a life lesson: if you believe in yourself and focus on the present moment, you will be successful. Since my seven-year-old breakthrough experience, I’ve found that most rules in theatre directly apply to life. For example, always support your fellow actors. Or, actually listen to what your stage partner is saying to you, otherwise you will anticipate rather than live in the moment. These theatrical rules apply to life because the arts and life are intimately connected. Without arts programs, kids would not learn how to build the confidence to express themselves creatively. Arts programs have the potential to change people’s lives at any age—why not start young? When I volunteered with YPT this past year in Ms. Jone’s fourth grade classroom at Watkins Elementary School, I personally noticed the spark that I once had as a seven-year-old in the eyes of the young, budding playwrights. As a volunteer for YPT, I’ve been able to see how good arts programs shape and form children’s views on life. I think most of us are jealous of children because they have the liberty of always jumping into situations with open arms; they have not yet learned the need to protect themselves or not to trust someone. Arts programs are necessary for children because children are open and ready to explore their creative thoughts. And they have brilliant thoughts! I have loved every moment of volunteering with YPT, and I have no doubt that this program has changed the lives of many young students. 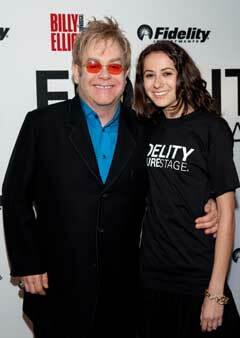 In high school, Madeline got to meet Elton John after her play won the Fidelity FutureStage Playwriting contest. 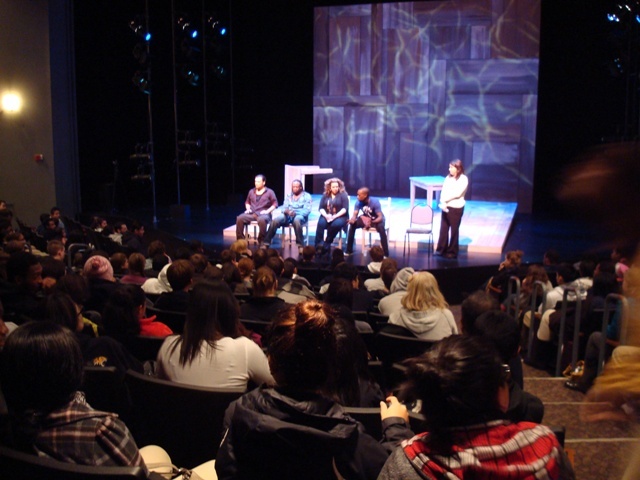 On Thursday, November 4th, we took two hundred twenty-eight students to see Ameriville, the new play by performance ensemble UNIVERSES, at Round House Theatre. Yeah. TWO HUNDRED TWENTY-EIGHT STUDENTS. It took a lot of work to get all of them from school to the theater and back again, but it was totally worth it. Field trips are one of my favorite things to do at YPT. It’s always an eye-opening experience for students to see professional theater, but the best part is that it creates renewed investment in their own plays. The two hundred twenty-eight students are eleventh graders at Bell Multicultural High School. They’re right in the middle of our In-School Playwriting Program, in fact the second drafts of their plays were due just one week after the trip. 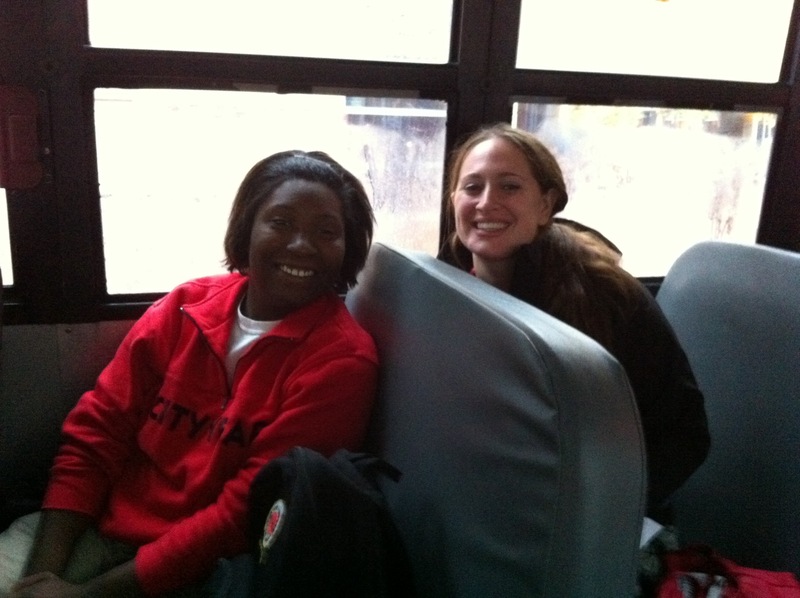 Bell is one of our favorite schools – we’ve been there for fifteen years, since the beginning of YPT. Ameriville promised to be a perfect fit for our Bell students. The play fuses jazz, Gospel and hip-hop with storytelling. At Bell, we’ve found that many of our students feel a strong connection to music. Over the years, when teaching artists have met with students who were struggling with their plays, we’ve often asked them to think about sound design. It’s almost foolproof – music provides a gateway into all kinds of artistic expression. Students identify a song that matters to them, and suddenly they realize that they do have something they want to say. So, yeah, a play with beat boxing in it? That was gonna go over well. The play was fantastic (you can read one review here), and I loved it, but I have to admit that I was also watching the students watch the play. They were definitely not a passive audience: they laughed loudly, clapped for the moments they especially liked, and occasionally responded with Ohhs and Ooohs. Kelly MacIsaac, Round House Education and Outreach Program Assistant, told me that our students were among the show’s best audiences, and that she could tell that the actors were feeding off their energy. “I’m so happy you’re here. These are the kids that need to see this show,” she said. Big thanks to the whole eleventh grade English team at Bell, our wonderful volunteer chaperones, the incredible Round House staff, and of course, UNIVERSES for making this trip happen.